A new organ is an exciting and significant stage in the musical evolution for a congregation and represents a considerable investment. This literature will provide a detailed explanation of the Phoenix Organ to those who have taken on the responsibility of recommending the purchase of a new organ. 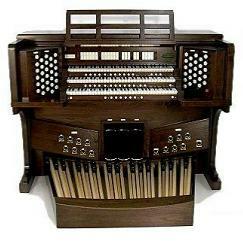 There are three distinctive features separating Phoenix Organs from other organ manufacturers. It is important for organ committees and organists to understand these differences. Phoenix pipe organ samples are by far the finest, most artistic available anywhere. Every Phoenix, large or small, is hand-crafted and custom built as with a pipe organ. We use the same high quality electronics and pipe samples in every organ, large or small. Old-world craftsmanship and the highest standards of excellence characterize the design and construction of Phoenix consoles, using traditional pipe organ components. Everything about a Phoenix Organ makes it authentic to its pipe organ counterpart. "Phoenix's ultimate goal is to build for you the best possible musical instrument. One that will give you endless hours of enjoyment, and like all works of art, be totally unique." (*NAC = No Additional Charge.